Hold On, Buyers—More New Homes Are Coming Your Way! Buying a home typically isn’t a stress-free, relaxing process. Buyers need to muster up a down payment, secure financing, and fill out mountains of paperwork—as well as have their offers accepted. And of course, they need to find the home of their dreams in the first place. But that last part may get a little easier soon. Builders secured more permits, about 1.26 million, in March, to put up those sorely needed, brand-new abodes, according to the seasonally adjusted numbers in the latest residential sales report jointly released by the U.S. Census Bureau and U.S. Department of Housing and Urban Development. Permits are a strong indication of how many new homes will go up over the next few months. That was a 3.6% jump from February and an impressive 17% increase from March 2016. Condo buyers and renters are expected to see more options come summer and fall as well. Permits for buildings with five or more units soared 18.3% from February and 26.1% year-over-year, according to the report. This brings the amount of construction in larger, multi-unit buildings back up to what it has been in recent months. Meanwhile, permits issued for single-family homes dipped ever so slightly, by 1.1% from February to March. However, they were up 13.5% from the same month a year earlier. That’s great news for buyers, as houses with yards out back, often single-family abodes, are the most in-demand. But not all of the news is sweetness and light. 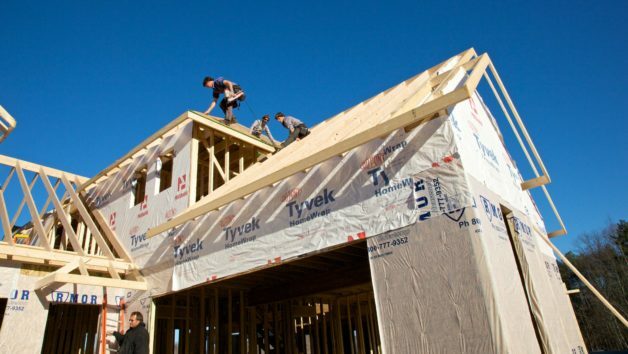 Housing starts—the metric tracking the number of homes on which construction has already begun—dropped 6.8% from February to March. However, it was up 9.2% from the same month a year ago. The number of finished new homes, overall, hit just over 1.2 million homes in March, according to the report. That’s up 3.2% from February and 13.4% over the same time last year. New homes typically cost a lot more than existing, or previously owned, ones. The median price of a new home was $296,200 in February, according to the most recent data available from the U.S. Census Bureau and the U.S. Department of Housing and Urban Development—nearly 30% higher than the price tag on existing homes. The majority of those new homes, about 819,000, were single-family residences. Builders completed 7.9% more single-family homes from February and 12.2% more than the same month a year ago. That’s the most new single-family homes that have been finished in any month during the last 12 months. The most new homes were finished in the South, at about 611,000. That’s up 6.6% from a month ago and 10.5% from March of 2016. The South was followed by the West, where builders put the finishing touches on about 290,000 new homes. About 191,000 new homes were done in the Midwest, up a whopping 52.8% from February and 12.4% from the same time a year earlier. The fewest new homes were completed in the Northeast, which doesn’t have as much land available to build on, resulting in higher prices.